Now that Spring is finally with us – it is a good time to think about gardening and management of the land. There has been a slowly growing trend in Bloomsbury, central London for residents (and their friends and supporters) to cultivate even the most smallest patches of earth and this has encouraged me to ponder about how the ancient Egyptians managed their often very small plots of land. This blog will be repeated anon – with images and additions. So, these examples are mini gardens created around the pits of trees. The knock-on effects of these endeavours have been dramatic: the air seems fresher, places look cleaner and people have even reported changing their walking habits in order to stroll down streets so beautifully planted and so much more appealing. In an environment notable for the relative (to desert) lack of cultivable land, the ancient Egyptians did pretty well when it came to land management. The ancient Egyptians were as proud of their gardens as are people nowadays. 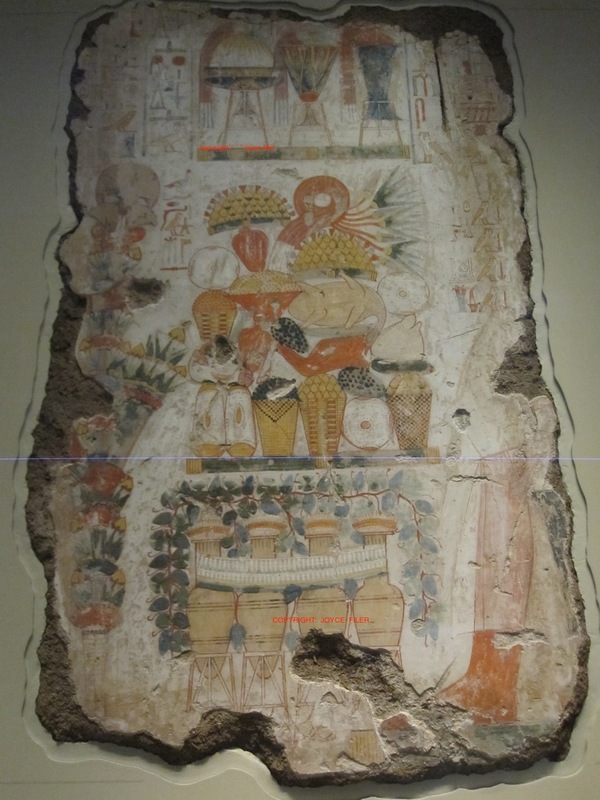 We know, from tomb reliefs and textual records, that the wealthy landowners cultivated gardens to provide trees, flowers and herbs and, in much larger farming establishments, food crops – much as the Egyptians do nowadays. In these larger tracts of land the aim would have been for farmers to produce enough crops to both provide for the people and, in good yield years, to have surplus crops to trade for other commodities. In times, when the Nile inundation was successful (ie. not too high nor too low) this aim was achievable. On the more modest front, the wealthy employed gardeners to maintain the gardens attached to their villa-like houses because the affluent ancient Egyptians wanted ornamental gardens, varieties of trees and flowers. One of the main tasks of the gardener would have been to supply the gardens in their care with water. A shaduf would have been used to move water from the river to the desired areas of the garden. The shaduf, still in use in parts of Egypt today, consisted of a long pole with a jar or bucket at one end and a counterbalance (probably dried mud) at the other end. The ordinary person in ancient Egypt may have had a very small plot of land – this may have been owned but was more likely ‘rented’. Studies of a variety of sources seem to suggest that the ordinary ancient Egyptian enjoyed a plain but nutritious diet: bread, beer, oils, a range of vegetables and, as nowadays, fish could have been caught. Certainly meat, from the larger animals (cattle and so on) would have been a longed for luxury for the ordinary person but perhaps meat from ducks and geese may have been a realistic goal on some occasions. It is surprising what can be grown on a small patch of land – as any modern allotment keeper will tell you. Onions, lettuce, celery and garlic (to name but a few) were cultivated to enrich the plain diet of the ancient Egyptian. Garlic, native to Asia and widely consumed by the ancient Egyptians, had useful, antibacterial properties; cloves of garlic were included in the tomb offerings of Tutankhamun. Whilst I have not seen any actual vegetables or salad items being grown in these modern tree pits, I have seen a variety of herbs being grown under some trees! A wide variety of herbs were available to the ancient Egyptians: coriander, dill, mint,cress and parsley amongst many. Ancient Egyptian gardens displayed flowers more at home in the fields: the cornflower and the poppy; the mandrake, with its yellow fruits, and the lily were also popularly grown. The tree pits highlighted above feature flowers known to the ancient Egyptian plus more. Despite being in Egypt for merely eight months, the group managed to cover a lot of ground – visiting various towns, famous ancient monuments and studying the local environments. Harriet tells us that she was told that she would find Egypt uninteresting – this was not to be the case. Harriet was determined to experience and record as much as she could of the places she visited and states ‘I carried compass and note-book, and noted down what I saw, from eminence to eminence, along the whole valley, from Cairo to the Second Cataract’; she published her account of this journey in March, 1848. In this ‘note-book’ she comments on aspects of the landscape and wildlife, noting the seemingly unceasing conflict between the Nile and the desert in claiming the land. It is clear she was aware of the then current research as she mentions the discoveries of watermarks high on the rocks made by Dr. Lepsius and his conviction that the Nile water bed had sunk over time; she ponders about the symbiotic relationship between the Nile crocodile and various birds. Of the various peoples her group encountered she notes Nubians with three cheek gashes as ‘beauty-marks’ and Nubian women with tattoo marks, blue underlips, nose rings and hair minutely braided. In keeping with her support of the abolition of slavery in America, she derides the evidence of human ownership which she actually witnessed in Egyptian slave-bazaars. Upon seeing the Colossi of Memnon (or The Pair, as she terms them!) for the first time she says ‘my heart stood still at the sight…. there they sat, together yet apart…… keeping their untired watch over the lapses of ages….’ Harriet recalls Strabo’s views that the Colossi were damaged by earthquakes. As was quite usual with these tours up and down the Nile, groups often re-visited sites as they made their return journey to Alexandria thus Harriet says she could not resist visiting The Pair a second time – but this time the group had a closer look examining the statues from the base and not from afar as they had at the first sighting and, again, Harriet was taken with the ‘impression of sublime tranquility’ and their ‘keeping watch’. 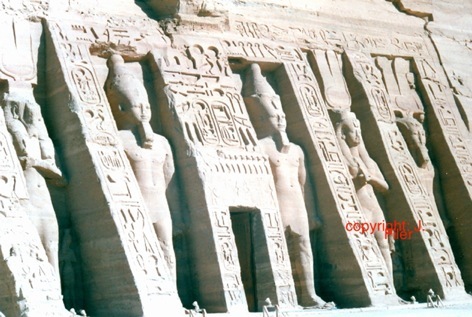 Harriet’s group visited a large number of temples including: Dendera, Karnak, Kom Ombo, the Rammaseum, Abu Simbel. Philae and more. I shall select a few of her more interesting statements about some of the monuments her group visited and incorporate her words, where appropriate. – and, interestingly again, she attributes their wrecked state to earthquakes. 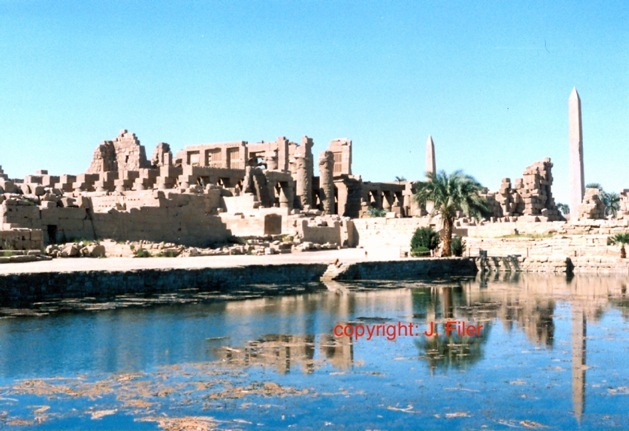 She considered the finest view of Karnak to be from a mound just above the lake and notes the remains of quays and baths around the ‘sheet of still water’ (fig. 4). Upon viewing the ruined sections of the Ramasseum (fig. 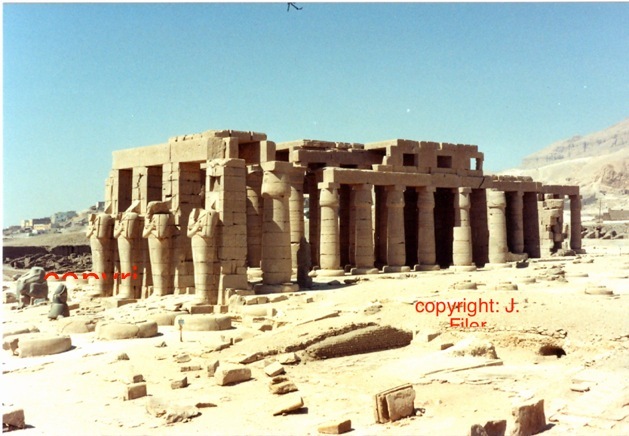 5), Harriet suggests that those of ‘the propylon outwork alone could build a cathedral’ so great were the piles of stone lying around and, like thousands of travellers after her time, she was very impressed by ‘the remains of the largest statue that even Egypt produced’. Consequently, she set about measuring again – telling us that the second toe of the foot block was 2ft. 7 ins. Interestingly, Harriet seems disappointed by the larger temple at Abu Simbel, which, she says, was ‘the chief object of our Nubian voyage’; she felt it appeared smaller and less imposing than expected and that the smaller statues (of Nefertari) look ‘dollish’ and ‘do not make Ramesses look greater’! She gives thanks to Mr Hay who had cleared much of the sand away from the temple’s northernmost colossal statue and is determined to scale the remaining slopes of sand because, as she tells us, ‘one cannot reach the chin of a colossus every day’! There is a small frisson of excitement, upon examining the statue at close quarters, when she ‘made a little discovery worth noting’, that there is evidence of ancient repair work to the statue’s chin. Harriet was, however, rather more impressed by the smaller Abu Simbel temple of ‘The Lady of Aboshek’ (fig. 6) viewing it as ‘striking’ and that ‘their reclining backwards against the rock has a curious effect’. Harriet was also impressed by the pyramids at Giza. She states that she had been warned that she would be disappointed in seeing the pyramids but ‘I had maintained that I could not be disappointed, as of all the wonders of the world this is the most literal…..so far from being disappointed, I was filled with surprise and awe……..this first view of them was the most moving’. Harriet exhibits obvious excitement tempered by apprehension when her group decides to scale the cataract in a small boat from Philae. It is important to remember that in Harriet’s time Philae was in a different situation than it is now; it has been re-located in modern times. Harriet saw Philae in its original position partially submerged by the Nile’s inundations (fig. 7). Modern eyes will never see that sight! Despite her obvious concerns about the dangers of approaching the cataract, she declares ‘such as event as the ascent of the Cataract can happen but once in one’s life…… what I wanted was to feel it’ and ‘the next (day) was to be the greatest day of our journey’. She describes the four hour ascent of the cataract and marvels at the skills, current knowledge and sheer force of the men as they hauled and manipulated ropes to control the passage of their small boat. Later that day, the group returned to see Philae by moonlight. On several occasions in her notes Harriet tells us of her experiences seeing the dead of ancient Egypt. At Asyut her group visits cave tombs and she recalls seeing a human skull ‘the bone of which was remarkably thick’ and on another occasion she states one of the group’s attendants actually dug up some mummies (fig. 8) – clearly for the entertainment of the visitors! Harriet opines that ‘mummies are little more respected in Europe than by the ignorant Arabs who pull them up and to pieces, for sale and use….’ highlighting the then profitable trade in mummies in which Europeans were the purchasers and the local people (needing the money) procured and supplied the remains of the ancient dead. In keeping with her compassion for her fellow human beings (past and present), Harriet states ‘these ancient people’s hearts once beat as did ours with the thoughts of three thousand years ago’. The legacy of Harriet’s works, beliefs and dedication to improving the human condition is kept alive today by the society named for her – The Martineau Society. In one sense she ‘lives on’ today – for what is little realised is that the Duchess of Cambridge, Catherine Elizabeth “Kate” (formerly) Middleton is a Martineau direct descendant from Harriet’s sister, also named Elizabeth! Today, the name Harriet Martineau is synonymous with social reform, human rights and religious tracts and was so during her lifetime. Readers may be aware of her work in America, where she actively supported the abolition of slavery, and her numerous publications on worker’s rights and Uniterianism, less attention is paid to her comments and observations about Egypt. Apart from the information she gives us about Egypt (as she saw it), I am personally interested in Harriet from the medical point of view – as a qualified audiologist and teacher of Deaf people – as you will read below. Thus, the intention of this article is to offer a brief overview of some of Harriet’s experiences whilst travelling in Egypt following a short introduction to her life and health issues. Where appropriate I shall include short diary quotes from the lady herself! Harriet Martineau (fig. 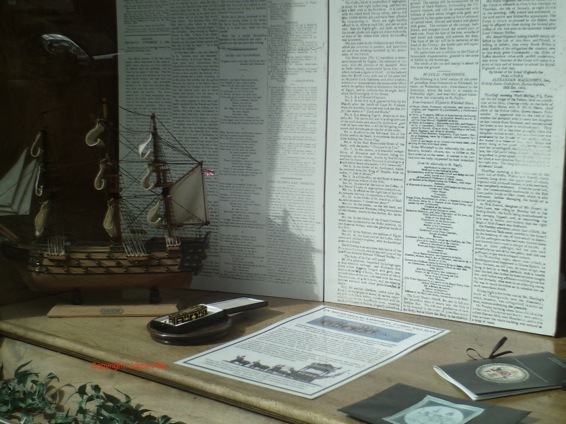 1a) was born in June,1802 in Norwich into a middle class business family. She seems to have suffered from poor health since infancy and, apparently, was not expected to live long – she did live, however, and died, also in June, in 1876, at the comparatively elderly age of 74 years. She appears to have had a remarkable memory for, in her diaries, she claims that her earliest memory was the death of Lord Nelson (fig. 1b) – she could only have been three years of age at that time! In her diaries she states that her life was overshadowed, and even controlled, by ill health; between the years 1839 and 1844 she lived as a complete invalid, it is thought she had an ovarian cyst. It is clear from her statements that she also experienced a worsening loss of hearing so that by her late adolescence she was quite deaf. Of course, we do not have access to the types of detailed measurements of Harriet’s hearing that is undergone by modern clients in an audiology clinical setting so we can only ‘guess’ at the extent of her infirmity. However, from the audiological assessment point of view, all the evidence suggests to me, as an audiologist, that Harriet probably suffered from a form of deafness known as otosclerosis. In this condition the bones in the middle ear harden and become fixed and, therefore, are unable to transmit sound. The condition affects mostly Caucasoid individuals and principally females; it seems likely that Queen Alexandra also suffered from otosclerosis. Harriet reports that she often cupped a hand around her ear to aid the direction of sound and there is at least one portrait of Harriet in which she is depicted cupping a hand to her ear; she often used an ear trumpet for the same effect. Her school experiences seem to have been greatly affected by her ongoing hearing loss, nevertheless, as we shall see below, she became well-read in both the Classical field and the then current archaeological theories. During her lifetime she produced many publications, including religious tracts, social commentaries and novels, the proceeds of which enabled her to buy herself a home in Ambleside in the Lake District. When we read Harriet’s works it is clear she was a woman of deep thought and seriousness. Some people have stated she was humourless, however, I discovered that she did possess a rather quirky sense of humour. With regard to her deafness she opined that it was no great disability as it meant she did not have to listen to the often aimless chatter of those around her! It was quite common for well-to-do Europeans to do a Grand Tour, especially of both the Classical world and the Middle East. In 1846, Harriet Martineau was invited to join a group travelling to the Middle East, principally Egypt and Palestine. 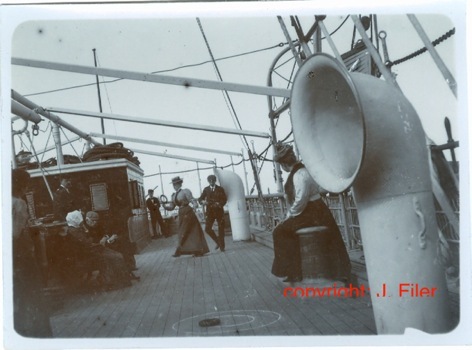 As was the usual fashion of the times, her group went by various steamers eventually arriving in Alexandria in November that year (fig. 2). Despite the group’s being in the country for merely eight months, they managed to cover a lot of ground – visiting various towns, famous ancient monuments and studying the local environments. Harriet states ‘I carried compass and note-book, and noted down what I saw, from eminence to eminence, along the whole valley, from Cairo to the Second Cataract’; she published her account of this journey in March, 1848. 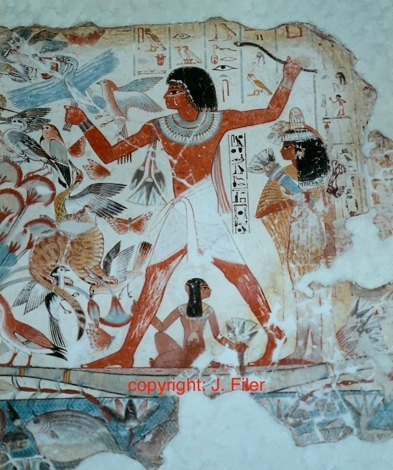 Part Two – what did Harriet see in Egypt = to follow – watch the next month’s blog space! The celebrations for Xmas and New Year are over – in our century, but, as I promised, there will be a part two giving more detail as to how the ancient Egyptians celebrated the most important occasion in life. As we shall see again, and below, reliefs on tomb walls show us how the ancient Egyptians had a good time and celebrated what, to them, was the most important party of all time – the Afterlife. These selected reliefs give us clues as to how the ancient Egyptians regarded their present (earthly life) as opposed to their expected afterlife – the goal of all time! The Ancient Egyptian party: what does it tell us? Thus, having been accepted into the afterlife they are then entitled to enjoy a good time! The people featured in the party have, as we are given to understand, passed the relevant tests set by the Gods and so are accepted for entrance into the next life. Yes, they are dead and, according to the tests they have passed, the Gods (and Goddesses) are welcoming them into the next life. How do we know they are being represented as dead? Well, it has often been suggested that the strange cones on their heads (see fig. 1) represent the fact that they are, in fact, dead. fig. 1: a high status party in the next life p note the cones (of animal fat?) on the heads of the musicians. These cones, which may well be blocks of animal fats, are perched on the heads of people guesting in these parties. Many researchers have suggested that these blocks of ‘fat’ are there merely to add a sensual feel to the scene – their being, probably, infused with flowers and aromatic oils. Thus, it has been suggested that, as in some tomb scenes, we can see the residues of fat melting over the party-goers costumes in the extreme heat, leaving a yellowish trail in its wake. It has been suggested that they are there solely to indicate sensual pleasure. Yet, perhaps this idea should be challenged. We should consider exactly how hot it would have needed to be (in these parties) in order for such animal fats to actually melt – I suspect VERY hot indeed! Do we accept this supposition that ancient Egyptian party-goers would actually undergo such extreme heat – extreme enough to melt animal fats? This would have been extremely uncomfortable (to say the least) – I don’t think any human being, ancient or modern, would willingly undergo such ‘torture’ – even for the sake of appearing at a great, high-ranking party! Not such a good idea! So, we return to the alternative idea that these animal fat cones on party-goers’ heads might, in fact, be really informing us that these people are dead. I feel it might be similar to the images seen in Christian art, whereby those who are actually dead (and are also, perhaps, martyrs) are shown wearing a halo around the head – indicating that they are now with God (ie. dead, in the physical sense). This may be the case in ancient Egypt – whereby the animal cone fat is a symbolic representation indicating that the people we are viewing are, in fact, dead! Thus, they are with the Gods – their ultimate goal. One of the essential ingredients for a celebratory party was of course – good food. No party is complete without such delicacies. 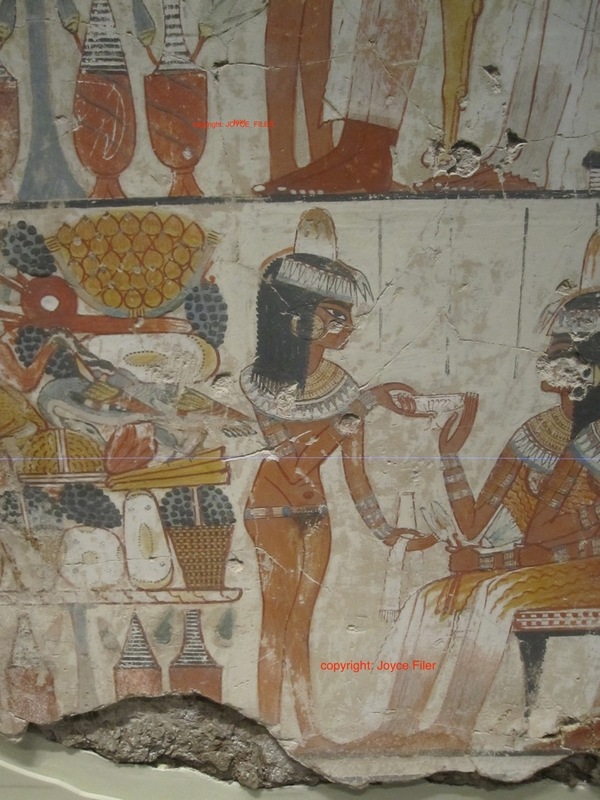 Many ancient Egyptian tomb reliefs show us depictions of tables laden with food. The scene in figure 2 is a fairly typical of the genre. Here we see a table piled high with tempting food items: fruit, bread, a leg of meat and other mouth-watering items. It is important to remember that certain items, such as meat, were indeed special items. The majority of ordinary people in ancient Egypt did not enjoy the luxury of eating meat. Meat (cattle, sheep, goats) were expensive and desirable items in ancient Egyptian society – but only the rich could afford to eat such things. Cattle were regarded as a sign of wealth and status – this cattle status is maintained in some modern African cultures (fig. 3). 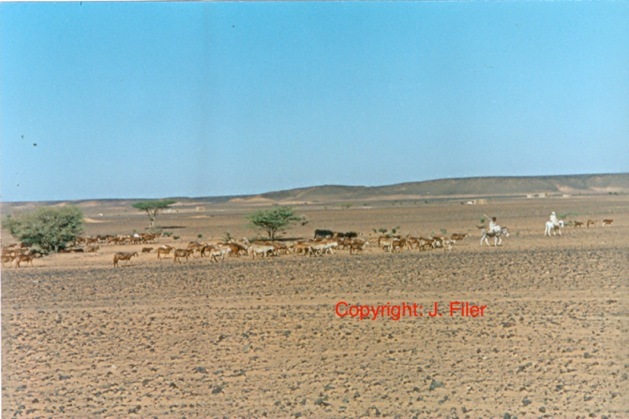 We know that cattle, for example, in ancient Egypt were considered as luxury items because we see scenes of (and read accounts of) cattle counts wherein wealthy Egyptians would count their cattle every year to find out how many adult cattle had died, how many calfs had been born – and so, enable them to assess their then current wealth. 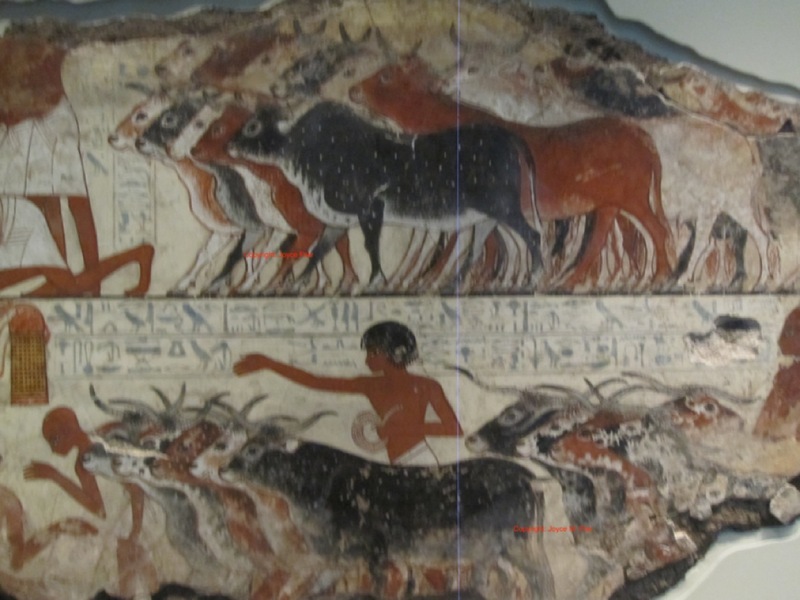 Figure 4 shows how well cattle were regarded in the ancient Egyptian wealth stakes! Beneath the table of food we see the other essential ingredients for a ‘good party’ – tall pots of liquid, probably wine, if the grape vines overlying them are indicative of the contents! Like any party, ancient or modern, people drank too much (fig. 5). fig. 5: alcohol, then as now, was very attractive at parties! fig. 6: the consequences of too much alcohol! The consequences are not unfamiliar – figure 6 clearly shows that ancient people suffered from ‘nausea’ as much as do modern people – nothing is new! Now we are in that strange no-man’s land of time – between Christmas and New Year – it is a good time to show (pictorially) how the ancient Egyptians celebrated the important occasions in life. Reliefs on tomb walls show us the ancient Egyptian capability for ‘having a good time’. Part Two in 2014 will examine the information in greater detail. 1. GOOD MUSIC and bring on the dancing girls!!! but, in ancient times, as in modern – there can be too much of a good thing!!!!! 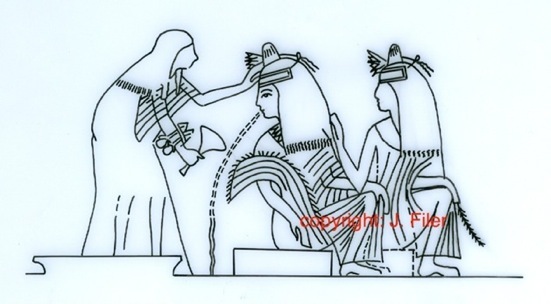 Drawing from a tomb relief showing the consequences of excessive alcohol consumption – nothing new there then!!! Following positive responses to an earlier blog about injuries in ancient Egypt and Nubia, and as a response to requests for more detailed information about head injuries, I thought it would be useful to consider the range of Egyptian/Nubian sources we have for head injuries in ancient times. When one mentions head injuries in ancient Egypt almost always somebody raises the question: did Tutankhamun die from a head injury? So I think it is important, straight away, to tackle this thorny question. 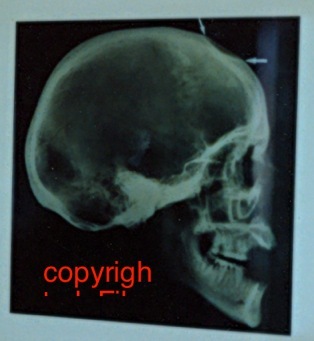 I am one of the few people in biological research who has actually seen the early X-rays of Tutankhamun’s skull – I can state quite categorically that there is no evidence whatsoever of his having received a head injury (either before or after death). In a forthcoming article on the famous young king of Egypt I shall address this question again more fully and deal with other controversial issues surrounding the biological evidence emanating from the examination(s) of his body. Throughout history cranial injury has been a universal event – people have inflicted injury upon one another sometimes in civilian or domestic disputes and more often during the course of warfare. The people of ancient Egypt and Nubia were no exception to this fact and we have evidence of such injuries, from predynastic times right through to the Christian Medieval period (1). Thus, the first aim of this article is to outline the range of sources informing us about the ancient Egyptian and Nubian experiences of head injuries (2). Overall, injuries to the head are more likely to be intentionally inflicted than those to other parts of the body, although accidental falls, although perhaps rarer, cannot be disregarded. Interestingly, regardless of the ancient culture concerned or the period in history under study, research has shown that universal patterns can be observed in head injuries with regard to gender involvement, position of injury and types of weapons used. Thus, the second aim of this article is to demonstrate how ancient Egypt and Nubia fits into this universal model of cranial injury. For both aims of this article notes and further references are included, where relevant. We are very fortunate that ancient Egypt offers researchers a large selection of artistic and textual sources concerning aspects of their society and from these we can glean quite a lot about trauma to the skull. Artistic sources clearly demonstrate the power of an actual cranial injury or the implied threat of inflicting one. A familiar ancient Egyptian artistic motif is that of the king (later Pharaoh) standing legs astride, grasping enemies by the hair and holding a weapon threateningly over them. Perhaps, the most familiar example of these ‘smiting’ images is that of the predynastic Narmer Palette – here, the king (Nar-Mer) grasps the locks of a bearded (ie. non-Egyptian) enemy with his left hand whilst holding a mace in his right hand; this iconographic stance is repeated throughout Egyptian history, probably as a symbol of power. Whether or not the kings of ancient Egyptian actually engaged in physical combat is not the point here – clearly the possible after effects of an injury to the skull ( brain injury, disability or death) was understood by all parties involved and thus, the power of merely the threat of such an injury would have been enough to subdue most enemies of Egypt. Further artistic evidence for head injuries is clearly demonstrated in the large number of battle scenes available for us to study (fig. 1); they also indicate the types of weapons available at particular periods of history. Thus, hand-to-hand battle scenes may show crushing, cutting or slicing injuries inflicted by maces, swords and knives whilst longer range combat scenes show bodies being pierced by arrows. 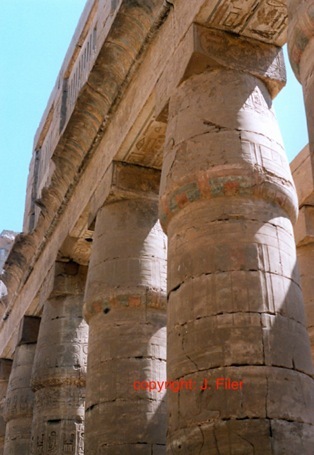 Ancient Egypt is a vast source of textual information and the medically related documents are most informative. Perhaps the most useful text pertaining to cranial injury is that known as the Edwin Smith Papyrus (3). It is often termed the ‘Surgical’ papyrus as it describes the diagnoses and management of a variety of bodily injuries, many of which involve trauma to the head. The papyrus was purchased by a wealthy American, Edwin Smith, after whom it is named and was translated by James Breasted in 1930 and a remarkably fine piece of work it is! The work is seemingly topographic in its design – in that it describes injuries to parts of the head and works its way down to the upper body. The cases of injury described were possibly those witnessed, recorded and reported upon by a surgeon; each case describes an injury, suggests a prognosis and recommends treatment (or not, as the situation demands). However, it breaks off (ie, the rest of the text is missing) in the middle of a medical case and we are left without knowing more! The Edwin Smith Papyrus describes a range of injuries from broken noses and cuts, which are deemed treatable, to the more serious incidents involving severe gashes and exposure of the brain – which, unsurprisingly, the author deems as fatal, using the ominous phrase “An injury with which I will not contend”. The archaeological excavation of human remains in Egypt and Nubia have brought to light quite a large number of head injuries and it is interesting to see how these compare with the universal pattern of head injuries and with those depicted in artistic and textual sources, as alluded to above. Researchers have noted that in most ancient cultures males sustained more head injuries than females, possibly because traditionally men were more involved in situations leading to trauma – heavy labouring jobs and, of course, war. 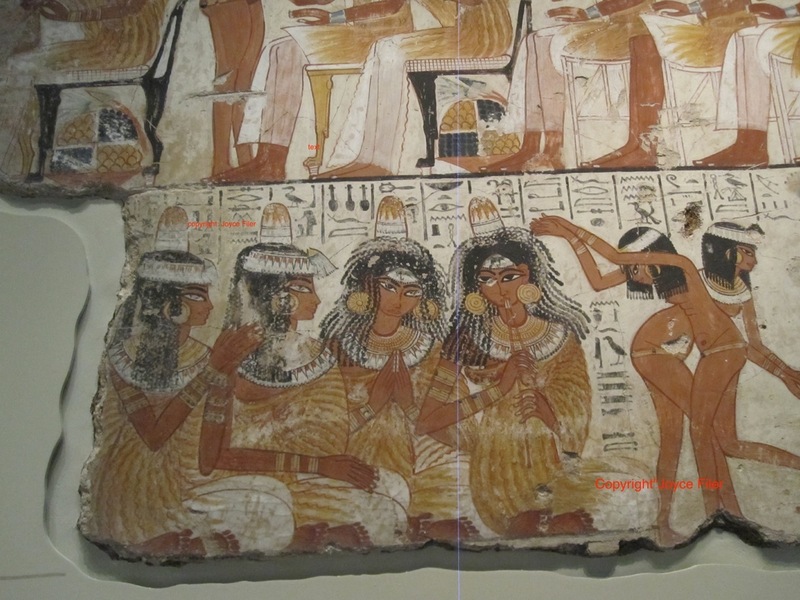 This gender ratio is seen in Egyptian and Nubian biological remains. We see men engaged in manual work in many Egyptian tomb scenes; other scenes show men engaged in combat, often with unprotected heads. In the universal sense, the majority of head injuries were inflicted to the left side of the head indicating a right-handed face-to-face assailant and possibly reflecting the Egyptian preference for right-handedness; some injuries affected the top part of the head suggesting an assault from above. My personal research has found injuries to the back and right side of skulls but they seem to be in the minority. Clearly, types of head injuries will reflect the type of weapon used. 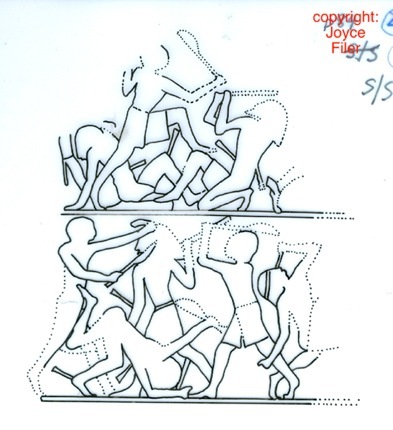 For example, the scene in figure 1 shows men engaged in hand-to-hand combat – thus any ensuing injuries will reflect this. Here we would expect slicing injuries, the severity of which would depend upon the strength of the metal from which the weapons were made. As this scene is from the Old Kingdom period the weapons were likely to be made of copper or bronze – which, although capable of inflicting serious injury, are softer metals than the iron used in later periods. In a large group of Nubian skulls I studied, the injuries were mostly depressions – some round, some ovoid, others longitudinal. The injuries on these skulls, which were from Kerma and dated to the Middle Kingdom period, clearly reflected the types of weapons and tools available to that society at that particular period: mallets, throwsticks and maces. The extent of such depressed injuries can be seen in the X-ray in figure 2. By contrast, a large group of Egyptian skulls (from Giza) which I studied were from a much later period (600 – 300 BC) and so showed far more serious injuries: gashes, blows and deep penetrating wounds; by this period of their history the ancient Egyptians had developed iron technology resulting in some heavy duty weapons – axes, swords and knives – capable of causing quite massive injuries (fig. 3). 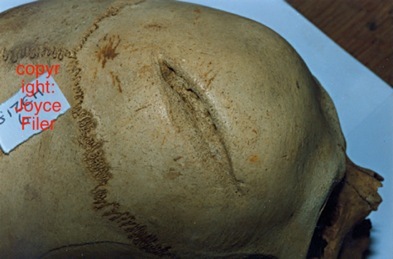 The head injury seen in figure 3 is a deep, penetrating gash probably made by an axe, however, despite its severity, the wound has healed well. Ancient Egypt and Nubia offers a large range of sources for the head injuries experienced during their history – textual, artistic and biological but clearly only a small sample can be included here. Few ancient societies can offer such a comprehensive range of materials for us to study in order to try and comprehend human behaviour in the ancient world and compare it with that of the modern world! It is quite clear that the ancient Egyptians and Nubians experienced head injuries in a similar manner to other ancient cultures. (1) Readers may be interested in looking at G. Elliot Smith and F. Wood Jones (1910), The Archaeological Survey of Nubia. Report for 1907-08, Volume II: Report on the Human Remains. 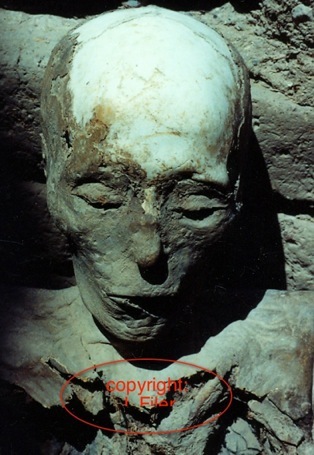 Cairo: 1910 – although this is an ‘elderly’ work it is an excellent example of the study of burials from these periods of Egyptian history; often quite ‘dramatic’ head injuries are noted for some bodies examined during this survey. (2) See further: Joyce M. Filer, ‘Ancient Egypt and Nubia as a source of information for violent cranial injuries’ in J. Carman (ed) Material Harm: Archaeological Studies of War and Violence, Cruithne Press: 1997, p.